Visual note taking is doodling with a purpose! It keeps you busy, awake, alert and with a few suggestions, attentive! Did you know you develop listening skills, organizing skills and synopsis skills by being a visual note taker? Amaze your friends (and teacher!) by actively taking notes during a talk, a film, or a presentation. To get started you need your journal (or blank paper), a few sharpened pencils, and possibly colored pencils or markers. To warm up, practice making letters- simple line letters. Adding lines above and below attracts more attention to the letter or word. Try outlining letters or words. This makes them appear larger and gives them more emphasis. “Fill in” the outlined words to give stronger emphasis. Try different styles of letters by printing words and writing others in cursive. Use different colors for main titles, subtitles, etc. 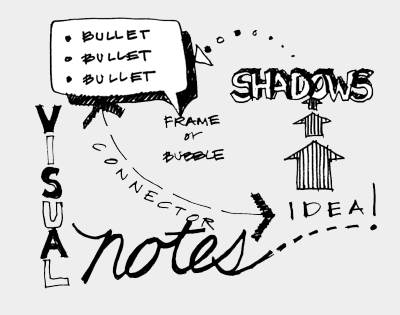 Be a visual note taker! Listen to a presentation by your teacher. Ask permission to use visual note taking. Make sure you have enough paper and enough sharp pencils! Start listening. Start drawing! Compare your visual notes to your classmates! What did you draw that they didn’t? What did they draw that you didn’t? Bullets are simple shapes that create categories and sub categories. Bullets can be any shape you choose - a circle, a triangle, a plus or a minus. Bullets help to create itemized lists and to group things together. Frames are shapes around pictures or words: think ‘picture frame’ or ‘word bubble’. 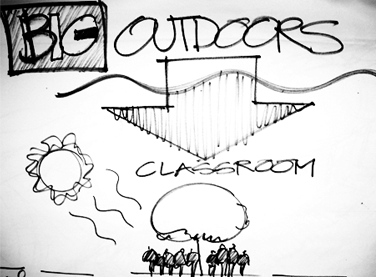 Frames create visual destinations in your visual note taking landscape. Next, you will need connectors. Connectors are straight lines, arrows, dividers, leaves, and people etc., that move from one note to another, making connections. Shadows, just like in drawing, draw attention. 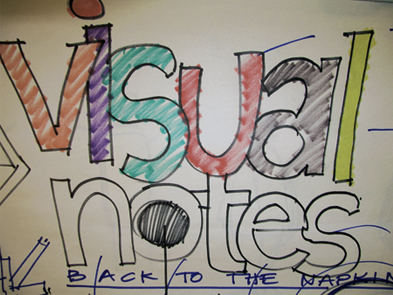 Watch visual note takers visually record and communicate ideas. Activity 3 – Practice Practice Practice! In your journal start taking visual notes of as many things as you can. Every circumstance offers new avenues for connecting ideas with images. 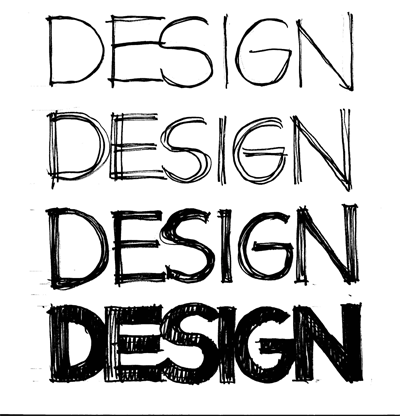 Your notes can then be organized, diagrammed and merge with sketching. Follow along with this video on words to diagram.What will you come up with next? Let your imagination go! Share your visual notes to see if they communicate to others what you were trying to capture. Bullets can only be lozenge shaped. Connectors are important because they can tie ideas together. Visual note taking is a waste of time. Visual note taking helps to keep people alert and listening. Frames help organize pictures or main ideas.